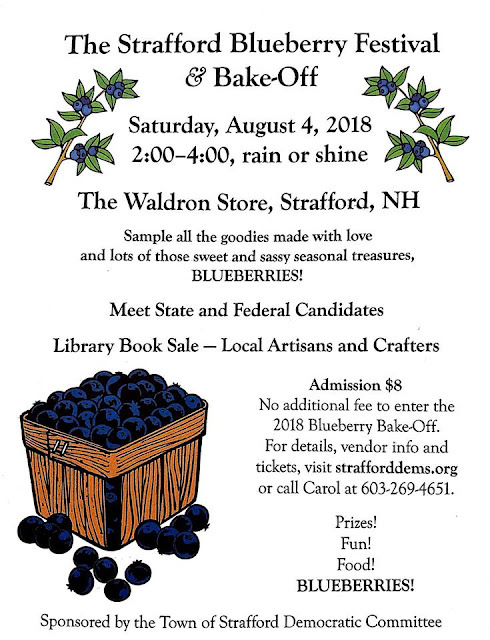 If you’ve got a favorite blueberry recipe or just love to eat blueberries, you won’t want to miss the second annual Blueberry Festival and Bake-off on Saturday, Aug. 4, from 2-4 p.m. at the historic Waldron Store in Bow Lake Village, Strafford. Admission is $8, with no additional charge to enter the bake-off competition. Tickets and contest rules are available at www.strafforddems.org. Once in the door, you can sample blueberry goodies to your heart’s content — and vote on your favorite. Prizes will be awarded for winning contestants, including a youth category. Please note that contest voting will close at 3:30 p.m. In addition to judging the region’s finest blueberry cooks, participants can purchase home-baked blueberry pies, muffins, and quarts of fresh-picked berries to take home. Adding to the fun, local craft vendors will be on hand to showcase their wares. Be sure to enter the raffle to win one of several specialty gift baskets. This year’s festival will also provide a great chance to talk to many state and federal candidates running for a spot on the Democratic ticket this fall. Come meet them in person and share your concerns over a piece of blueberry pie. The festival is sponsored by the Strafford Town Democrats and is open to the entire community. The event is on, rain or shine. The festival venue, the century-old Waldron Store, is located at 492 Province Road in Strafford, adjacent to the Bow Lake Baptist Church. Learn more about the fascinating history of this building at http://strafhist.weebly.com/waldron-store.html.